I have this tug in my heart reading your post, and realizing now that your trip was the culmination of friends giving to a friend. You lovingly preparing each meal and providing nourishment to the family, WOW. 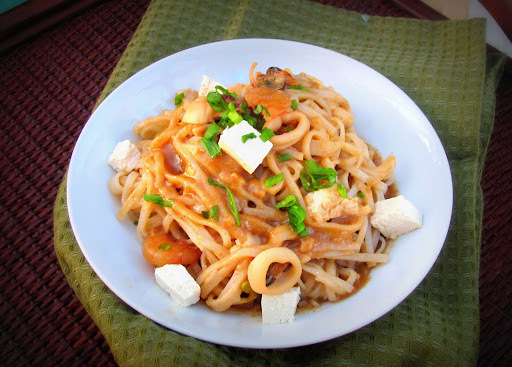 The peanut sauce add an interesting touch that i hope you will be able to try. Thanks amiga! Another spin Malou. You are very creative. You are inspired because the task is something very inspiring. It was a great honor to do so and I'm so grateful. wow! this looks and sounds fabulous! yum! thank you for this recipe. Thanks for the blog love. sure I'll go check right back. no it doesn't taste like palabok. it's more of a thai inspired noodles. Will cook this when we get together. Thanks for the blog love. 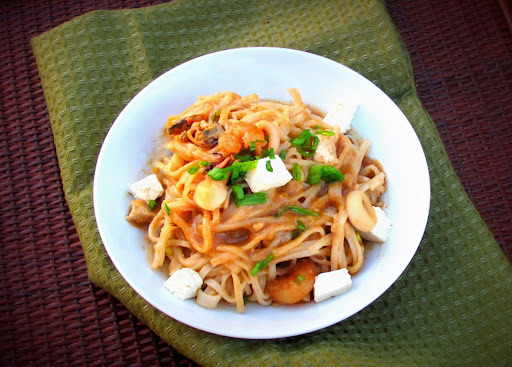 What a lovely story and a great seafood noodles recipe! Can't wait to try this. You just made me hungry for dinner and it's only midday! Thanks for the kind blog visit & nice support you always shower me with. All the best, Malou! So did you have it for dinner? hihi I hope you could try it one of these days. Thanks again. I'll be there checking your blog too for you... no worries! Oh super delish. So nice of you - didn't realize that's what you were doing. 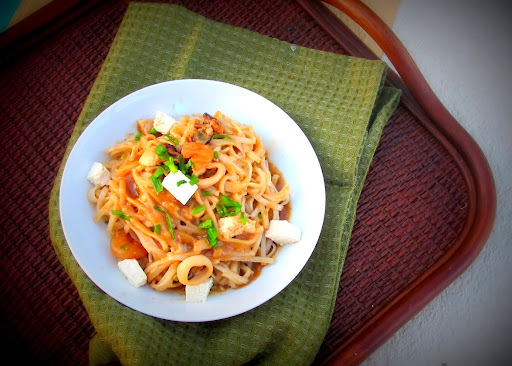 I like this twist on kare kare into a dleicious noodle dish. I'm glad you like the twist that I made. But yeah that's what I did in Orlando and I loved every bit of it. Hi Malou! I am so happy that you stopped by my little blog and introduced yourself and equally happy that you are back in "The Lou". I look forward to following your great blog! Hi Malou, now that you finally got my msg. on twitter, I hope the word verification is gone now so I can comment! Your blog isn't the only one that I have this problem with the word verification. Don't know why it's blocking me, but hopefully it's all resolved now! The only thing that concerns me is the soaking of the linguine (just can't imagine soaking the linguine)...on the other hand, the rice noodles YES! Finally you're in! SO happy to finally see you here. Thank you also for bringing up the linguine part. The soaking is only for the rice noodles. I should edit that part totally to avoid confusion. Thanks mi amiga. Oh Malou, I think I could eat this peanut sauce on a piece of old rubber tire. Yum! You made me LOL'ed so much Maureen. Have a great weekend. Kare Kare na oxtail is one of my fav dishes so you can tell that I'm real excited about your post! Love what you've done here, I can taste it already! Thanks Adian. I hope you will like the seafood instead of the oxtail too. Thanks Reb... my TV celebrity friend. Such a nice thing of you to do! And I'm sure your food was much appreciated - heck, I'm getting starved just looking at this great dish! Really nice flavors, and a great way to use rice stick. Good stuff - thanks.